Truck Accessories Insider is your way to knowing the "inside" information about Truck Accessories for your new Ford F150 King Ranch Supercrew. I'm Ivan Smith and have been in the Truck Accessory business for 24 years. I know truck accessories and I know you want the best inside information you can get on the pro and cons of what you may be about to purchase for that new Ford F150 King Ranch Supercrew. When you pull that new Ford into a dealership (better be careful) or maybe a Mom and Pop accessory store you will be the "informed consumer". You will have done your homework. The internet provides you with a wealth of information and most of it is biased toward selling the product. Some products require installation and may be better to buy at a local truck accessory store. Some products are easy to install yourself and some are not. You could end up with a "nightmare installation" and screw something up. Most truck accessories aren't really that difficult to install and can really make a difference in the looks of your truck. Fender flares, grill guards, billet grills are just a few of the enhancements that can give your pickup "the look". You maybe wanting to add some "protection" and will find the articles on truck bedliners very informing. There are shipping questions when you are buying online. Is it "UPSable?" is one of the more common questions that need to get answered. A plastic bed liner ... due to its size ... can be VERY EXPENSIVE to ship and you should know about some other options. Always ask if your product can be shipped DHL. This can make quite a difference in what is going to go on your credit card. DHL doesn't have the "girth restrictions" that UPS does and they will ship for a lot less. A tool box for instance can cost over $100 on UPS but with DHL its usually $60. You need to know these things! Now you can read a one page synopsis of the pros and cons of different pickup truck accessories. There are so many ways to enhance the way your truck looks and you will have a lot of decisions about pricing and quality. Take a minute and learn what you need to know. Just click on the link of your interest. 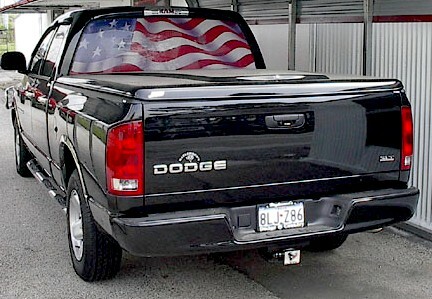 This is my 03 Dodge. I put more stuff on it than most people but just to give you an idea of the kinds of products available ... here's the list. Jason "Rage" fiberglass tonneau cover with keyless remote and carpeted insides, Pop n lock tailgate lock, billet third brake light cover, class III receiver hitch, Hammerhead hitch cover, stainless steel fender flares, stainless steel rocker panels, Wheel to wheel nerf bars, back up warning device, Bedrug, Glasscape, Stainless frame mounted grill guard with lights, stainless taillight guards (not shown), custom billet grill insert, dash mat, Austrailian sheep skin seat covers, door handle covers, carpeted custom floor mats, 2" lowering shackle, PetroMoly oil, K&N air filter.